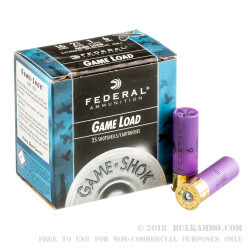 The vivid purple hulls of the 16 gauge Federal game load are a visual cue to the size difference of the load relative to 20 gauge or 12 gauge. A classic load for shotgun hunters, the 16 gauge isn’t nearly as popular as it once was, but offers a great harmony between the load weights and ballistic patterns of the 12 gauge while offering the lower recoil basis and the sporting challenge of having less payload to work with. A simple, refined feeling to the 16 gauge platform makes it approachable and desirable for those who want a challenge or who feel the 12 gauge is too powerful for their shoulders or for the game they seek after. This 1165 feet per second of muzzle velocity round pushes an ounce of lead #6 shot out of a 2 ¾” shell that is by no means a mild round, except in relative terms to the 12 gauge. The relatively stout nature of this shell means that 16 gauge shooters can expect excellent performance on game birds of all types where lead shot is still acceptable. 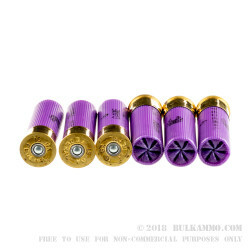 The bulk pricing offers a significant discount for those shooters who prefer this caliber.